Have you looked in the mirror recently and noticed brown spots on your skin? 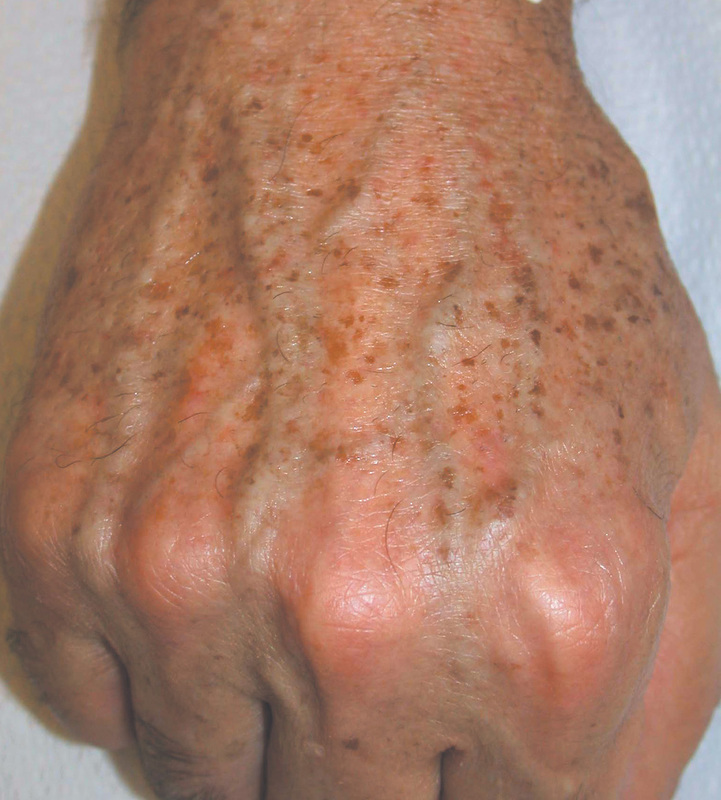 Sunspots are dark portions of the skin that develop after being exposed to direct UV rays. All ages can see these spots appear but those of you with fare skin will see it more frequently. They are most commonly seen around your face and hands. Here at Skin Perfect we have skin care treatments that will help improve the discoloration in your hands and face. Our first step is to evaluate and analyze your skin by doing skin imaging. Skin imaging is a thorough analysis of your skin using photographs. An introductory treatment will be performed to determine the condition of your skin. Following your skin analysis, we will design a treatment and product recommendation to target your optimum goals. You will also receive a complimentary mini mineral makeup application by our experienced makeup artist. Our sun reverse body treatment is ideal for women and men wanting clearer, smoother skin on their chest, back, arms, legs, hands and feet. This treatment will polish and tone the entire body. While single treatments may help brighten the skin for a special occasion, it is recommended to do a series of treatments to help improve more mature, photo damaged skin for a longer lasting result. This treatment lasts 30 minutes and can be done with a clinical esthetician for $175 or a master esthetician for $200. Our age defy platinum treatment is one of our bestselling treatments. Truly defying age with three forms of exfoliation, this treatment can improve discoloration and soften fine lines and wrinkles for sun damaged or aging skin. With one treatment you will see a dramatic difference. This treatment lasts 60 minutes and can be done with one of our clinical estheticians for $125 or a master esthetician for $150. For those of you who have chosen one of our other unique treatments and would like at home ideas for your sun spots, we suggest trying these remedies. Always wear moisturizer with high SPF even on those days the sun is not shining, we suggest our oil free moisturizing sunscreen. Lemon has a great deal of citric acid that has great healing properties. 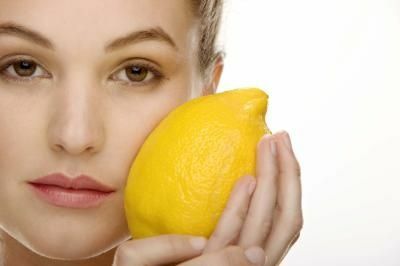 Place lemon juice on sunspots and allow it to sit for 10 minutes, but avoid the sun during this time. Lastly, buttermilk has been used for decades to lighten sunspots but tends to be more effective on those that do not appear on the face. Allow the buttermilk to sit on the spots for several minutes and then gently wash it away. We hope this summer you follow these steps so you can enjoy the sun without those sunspots! Our Skin Perfect Shopping Guide for Busy Moms! After posting our blog on working mothers we wanted to take things a step further. Here are some facial and makeup products we suggest for those mothers on the go! We want to help make your day go smoothly as possible and help you achieve the skin you deserve. 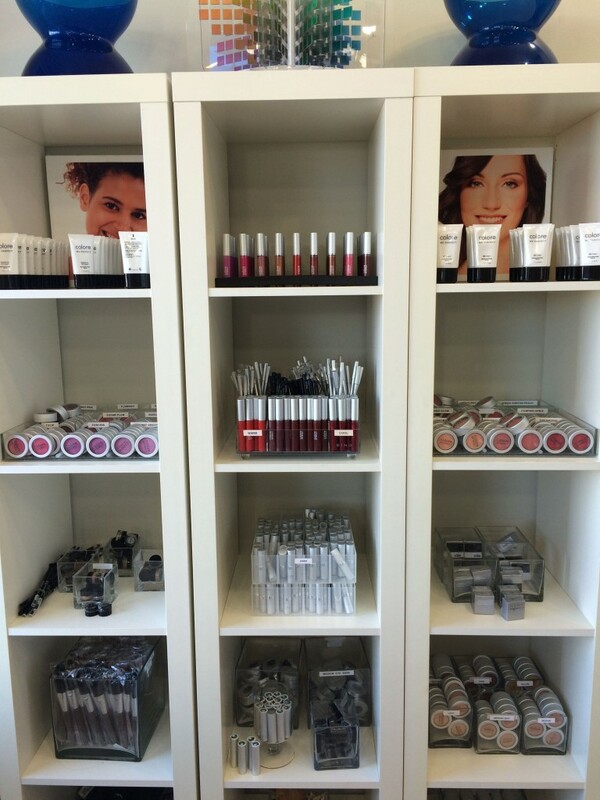 All of these products are recommended by our expert estheticians and makeup artists. Take a break from your busy day and stop into Skin Perfect to shop around. Mascara – Every girl loves long dark lashes, there may be days where you only have time to add one makeup product. Mascara not only makes your eyes pop but it makes you look more awake. CC Cream – This product is amazing and anyone can use it. CC stands for Color Corrector it is a primer for foundation, it has an SPF of 20, and can be worn alone under powder or foundation. Powder stroke – After you add your cc cream try our loose powder all in one, comes in matte or shimmer finish. Concealer – Did you only sleep four hours last night? If so you may need to add some concealer to cover those dark eyes. Lip Gloss – Maybe you don’t have time to add lip liner and lip stick, if this is the case try one of our amazing lip glosses. Setting Spray – Finish the look with our newest product, setting spray, your makeup will last and you will feel refreshed. Growing up I never understood the term “working mother”. I remember always hearing my mom say she had no time for herself because she always had things to do. 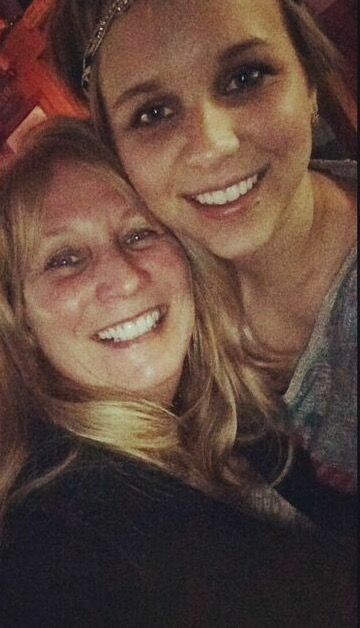 At that time she was a stay at home mom and I was confused as to how she never had time. Now that I am an adult I understand just how it feels to not cross off all of those “to-dos” on my schedule. She never had time to pamper herself because she was unaware of any quick makeup and skincare tips for mothers on the go. I am here to help you makeover your beauty routine with a couple of quick steps. If you want to have a quick makeup look you need to have skin that is taken care of. If you have children especially newborns it probably feels like you haven’t slept in months. After you move the bottles and baby clothes to the side, place a cleansing product on your night stand, we suggest our glycolic toner. All you need is a cotton ball to apply it to your face, that way your hands do not get messy. When it is in your sight before going to bed you will be more likely to use it. Many new moms experience hyperpigmentation or darkening of the skin. Since you cannot use retinol while breast feeding, apply some of our triple antioxidant serum during the day to help control the dark spots. At night after you have cleansed, add our pigment control to help reverse dark spots and follow up with a moisturizer. Lips might be the only thing you have time for in the morning. First you need to apply either our bb or cc cream, which doubles as an SPF and light weight foundation, then use our Colore Me Perfect concealer to cover any dark spots. Line your lips and fill them in with the color of your choice. If you have extra time try adding some mascara to brighten your eyes. If you are on the go try wearing our juicy lip gloss can instantly make you look polished and it goes well with all skin tones. Now let’s talk about hair, there are so many styles to choose from. Many moms tend to shower at night before bed because this time is usually less hectic. This is the best time for you to get your hair ready for the morning. After you get out of the shower apply some mousse or thickening spray to your hair. While your hair is still damp, part your hair and braid it to the side. In the morning when you wake up all you need to do is take the braid out, add some hairspray and you will be ready to go! I promise with these few steps you will start to feel relaxed and more polished for your busy day! Are you a new mom and feel like you get no sleep? Are you awake all night taking care of crying children? Do you have a headache within the first five minutes of waking up? If you said yes to any of these questions, you might need a little stress relief! Being a new mom has turned you into wonder woman, but many times you feel like sleepy from the seven dwarfs. The staff at Skin Perfect is here to help you feel like wonder woman all day. We love seeing the same clients come in every month, but we know sometimes it is hard to find time especially as a new mom. We want to give you some tips on how to stay relaxed at home. Let’s start with the most important step, breathing. There are many times your baby won’t fall asleep when you need them to, or they just won’t stop crying. During this time try to focus on your breathing, notice how the air feels as it moves in and out of your lungs. Silently repeat a calming phrase like “peace” with each exhale for 1 minute, or until you feel more relaxed. Repeatinga mantra allows you to focus on something, so you won’t waste energy by feeling annoyed. This will give you more patience so you can concentrate on calming your baby. Another popular option for relaxing is essential oils. At Skin Perfect we use and sell Doterra Essential Oils, the scents smell great and the clients love them! There are so many scents that will help you stay calm, sleep better, and help you focus. Bergamot is a calming and soothing aroma, it promotes healthy and clear skin as well. Lavender is used for its calming and relaxing qualities, it also eases muscle tension in the head and neck. Breathe is an oil blend that is perfect for nighttime diffusion allowing a restful sleep. Essential oils are the smart way to go if scent is a way to help you relax. Nighttime is probably the time when you can spare 15 minutes for yourself. During this time we suggest you take a bath and meditate. The best part about taking a bath is the warm water and the scent of the room around you. Add a couple drops of essential oils in your bath and this will help smooth your skin and relax you. Try to focus on your breathing and the warmth of the water against your skin. Let go of all of your thoughts, maybe even incorporate a little bit of music so you can drift away. Try these steps every day or every other day and you will find yourself more relaxed. What Type of Eye Makeup Should you Doing? Life would be pretty sweet if one makeup how-to worked for everyone, but we know that we’re all unique in so many ways.While there’s no hard and fast rules when it comes to liner, like any other cosmetic, certain types can suit different people better than others. Ever envied your friends black rimmed eyes but wonder why it doesn’t quite hit the mark when you try to replicate it? You might not be choosing the most flattering way to apply. Check out our guide and find out how to do eye makeup that suits you. If you have almond eyes they will look like the humble almond nut. When you look straight ahead, your iris disappears into your upper and lower eyelids. Considering you have “perfect” proportions, any eye technique will work for you. You can go nuts with winged liner to complement the wonderful curves of your eyes. If you want to use a regular pencil liner, draw a thin line for small eyes, but go a bit thicker for bigger eyes. If you look at the gap between your eyes, could you fit another eye there? If not you have close set eyes. 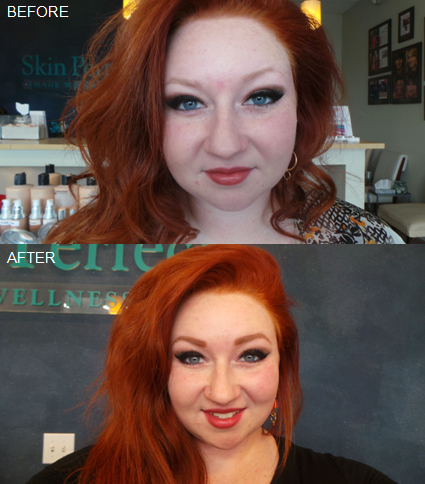 Use light colors on the inner corners, and extend the outer corners using dark colors. When applying liner only do the outer corners, try not to go all the way to your tear duct. Also try using mascara on the outer part of your lash line. Your eyes are set deep into your skull, so when you open your eyes, the space between the lashes and brown bone recedes. Apply light colors on the mobile lid, with a deeper color on and just above the socket line, blending up and out. Avoid drawing a thick line on your top lash line as this may cause your eyes to look more sunken. If you notice that your eyelid droops down over the crease when your eyes are open, you’re the proud owner of hooded lids. Use matte colors in medium to dark and keep eye makeup simple. When using liner start by thickening your lash base by applying liner between the roots of your lashes and be sure to apply your liner thicker at the outer corner of your eye. If your eyes have a slight drop at the outer corner of the eye, then you have down turned eyes. The focus for this eye shape, is to shade “up and out.” Apply liner to the upper lash line and blend shadow along the socket line in the outer 2/3 of the eyes. Curling lashes and applying mascara can also help to “lift” the eyes. What Exactly is Collagen and Elastin? Collagen and elastin are protein-based fibers that are found within the skin. These fibers are primarily responsible for that youthful skin that we all long to have. Collagen is accountable for skin’s firmness and youthful texture; while elastin is responsible for the turgor and elasticity or “snap-back” ability. Skin that has been repeatedly damaged and unprotected, also has damaged collagen and elastin, resulting in the appearance of wrinkles and poor texture. Collagen makes up a large portion of the skin, so much so that if you were to take out all of the water from your skin, collagen would make up about 70% of what is left. While elastin makes up a smaller portion, it is just as important to take care of and maintain. 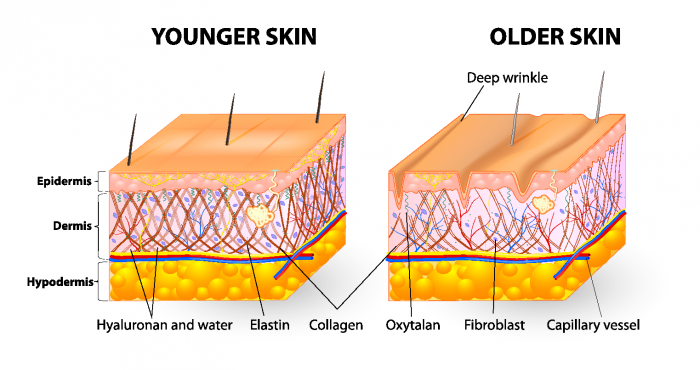 There are many anti-aging creams and lotions that claim to contain collagen and/or elastin, but a little unknown fact is that those products cannot replace the collagen and elastin that have been damaged in the skin. The protein molecules in those products containing the collagen and elastin are too large to actually penetrate the skin, and therefore only helps to bind water to the skin surface, giving off a temporary anti-aging effect. This will not actually put more collagen/ elastin into the skin, nor will it stimulate the skin to produce more. So, is there any hope? Of course there is! Your Skin Perfect esthetician will recommend the best treatment for you, as we know that not two clients have the same skin, so there is no “perfect” or universal product or treatment that works on everyone. One option is to introduce your skin to topical retinols, peptides, and/or other active ingredients that will actually stimulate the production of more collagen and elastin. Another option to stimulate more collagen would be microneedling, or collagen-induction therapy. By microneedling, your esthetician creates controlled damage to the skin, and actually produces microscopic punctures in the skin. Your skin, by nature, actually produces more collagen to repair itself, and the collagen will then create a “scaffolding” affect and will fill in the separated area/ puncture. Cell Reactivate is another treatment series that will assist the skin in creating more collagen. While collagen is fairly easy to stimulate (by a professional), elastin is much harder to stimulate and produce. Microcurrent, however, is one of the only treatments that has actually been proven to stimulate to the reproduction of elastin. Is there anything you can do to protect your collagen and elastin from becoming damaged? As always, sunscreen, sunscreen, sunscreen! Broad spectrum sunscreen is the most effective treatment for protecting collagen and elastin. Antioxidants, in conjunction with sunscreen, will also help to maintain the quality of your collagen and elastin, as it protects the skin from oxidative stress that can be just as damaging as the sun. How many of you love buying a brand new tube of lipstick? From nudes to playful pinks, these trending shades will be love at first swipe. This year a soft lip is a refreshing change for spring, when bright fuchsias seem too heavy. Luckily, many rosy nudes and berries flatter all skin tones and ages. Go sheer for a natural daytime look and matte for nighttime impact. When applying these colors try applying directly from the tube, you’ll get more drama that way. It also helps deposit the color right on the lips instead of having to apply multiple layers with a brush. If you make any mistakes, clean around the edges with a lip brush to create the perfect shape, or take a small Q-Tip and dab along the edges to blur the color out slightly. Last but certainly not least make sure you pick the right lip color for you. You may need to try a couple shades until you love your lip, you can always refer back to your color palette, or ask one of our makeup experts. 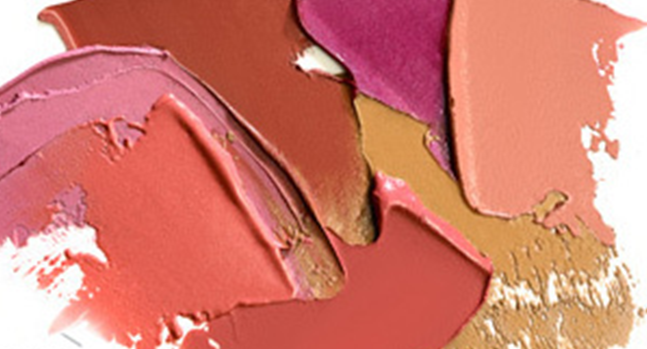 Check out the colors below for the seven best lips for spring 2015. Spring has officially begun! I know it is hard to fathom, many of us drove home from work at the beginning of this week in a snowy white out. Let’s try to smile and look at what’s around the fashion corner once we put away those snow boots and life gets a little prettier. According to the experts, expect some power shoulders from the 80s and tie-dye, flowing dresses, and big florals from the 70s. These styles are suited for anyone, whether you like tight clothes or you prefer loose and comfortable. Another look that seems to be popular is the safari chick, greens and tans. All of these fashion choices seem fun and great but how do you know you will rock the 80s and/or 70s look? Once you know your color palette choosing the right summer look will become a lot easier. Many of us know what color we look good in and some of us could use a little help. The best way to tell what colors look best on you is by comparing them to your skin tone. Something Skin Perfect offers is a service called Color Analysis. This service not only helps you find the right clothing to choose based on color, but it also helps with makeup choices, and home décor choices. Color is all around us, especially this time of year. Here at Skin Perfect we want everyone to feel confident in their skin and in their colors. No more hiding behind the black clothes, try standing out with the bright colors that are in your palette. I look back on pictures of myself, from that awkward time thinking, “what in the world was I trying to accomplish with that much eyeliner?” As a natural redhead, my eyelashes and eyebrows are blonde. I’m constantly trying to play them up because I love making a bold statement. Around 5 years ago, I started wearing strip eyelashes every single day and I have been in love with them ever since. Even though my eye makeup was how I liked it, my eyebrows were too light to really frame my face like they should. I started filling them in and it became part of my daily ritual, which was very annoying and time-consuming. I started working at Skin Perfect nearly two months ago and was introduced to the wonderful world of permanent makeup. I expressed my interest in getting my eyebrows done, and a couple weeks later I had the procedure done by the wonderfully talented Susana Benson in training, accompanied by Jaclyn Peresetsky. I absolutely love my new eyebrows and I love the extra 15 minutes of sleep I get every morning by not having to wake up and fill them in, while making sure they’re even when I’m still half asleep. It honestly has been the ultimate confidence booster for me and I cannot wait to swim this summer without worrying about whether or not I’ll still have eyebrows after I leave the swimming pool. It was well worth the time and investment. I’m a very happy customer. How many of you love food? I know I do! This month is national nutrition month. I’m sure most of you know that good nutrition can help with your skin care problems. Let’s start with a food that people either love it or hate it, and that is Salmon. It is one of the best foods for sources of omega-3 fatty acids, which helps keep your skin supple and moisturized. Salmon has selenium, a mineral that protects the skin from sun exposure; thereby minimizing your chances of sun damage. The Vitamin D in salmon keeps your bones and teeth strong and healthy. For those of you who do not like salmon, try it grilled, baked, or in your pasta, salad, sushi, or grilled with a side of asparagus. Another food superstar for your skin is blueberries. They have been ranked number one in antioxidant activity by the U.S Department of Agriculture compared to 40 common fruits and veggies. The antioxidants in blueberries protect you from premature aging. So consider adding half a cup to your yogurt or cereal every day and you are good to go! Additional healthy foods for your skin are Walnuts. They are one of the best snacks to keep your skin glowing. The nutrition of walnuts have many benefits: smoother skin, healthy hair, brighter eyes, and strong bones! Get your daily dose of nutrients like omega-3 fatty acids and Vitamin E by eating a handful of walnuts or throwing them in your salad, pasta, or dessert. Lastly, dark chocolate, one treat every girl has hidden somewhere, is our favorite superfood for the skin! It helps skin stay hydrated and protects skin from sun damage, and contrary to popular belief, chocolate does not cause acne. Now before you make a mad dash to that hiding spot, keep in mind the best kind of dark chocolate has a high flavanol content and should be at least 60 percent cocoa. I hope I have inspired you to use these nutrient packed goodies in your meals and snack and have the skin you have always wanted!